Pablo Iglesias in debate, February, 2014. Demotix/Nacho Goytre. All rights reserved.In a dismal post-European election scenario, in which the extreme right has managed to emerge as the leading political formation in a number of European democracies, Spain has once again lived up to the 1960’s tourist slogan “Spain is different”. 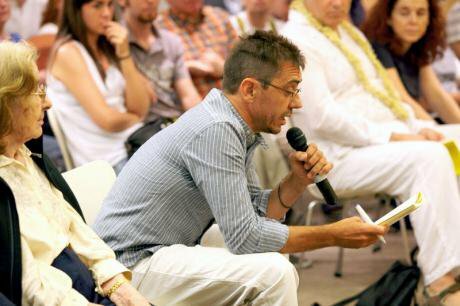 Juan Carlos Monedero, July 2011. Demotix/Nathalie Paco. All rights reserved.From there he began to be invited to appear regularly on political “tertulias” or televised forum debates recently so popular in Spain, breaking from the alternative leftist circles into a wider audience. Iglesias has been an eloquent spokesperson, echoing the critiques and sentiments of many people, effectively taking on right wing and centre left pundits in the media, and unafraid to tackle issues of political corruption and hypocrisy head on. The other crucial "15-M style” mechanism of Podemos was the participatory method for developing the electoral programme, one that used web tools that permit the collective development of documents, with a team of “synthesizers” from Podemos pulling together the final programme. This open and participatory method, in which any citizen could take part, was an attractive and successful aspect of the new approach. Citizens do not need to be card carrying members of Podemos to participate in the party, a dynamic far removed from the traditions of party militancy of formations like IU, PSOE or even the PP. * Podemos co-opts a movement that, while not anti-political (as some claim) was autonomous or apartidista (non-aligned to any party and refusing to allow parties to co-opt or act in a representative capacity). * 15-M was about imagining a new form of direct democracy and people power from below, not entering into the political circus of party politics. * Podemos is actually just IU (or another leftist party, Izquierda Anticapitalista) in new clothing, since the main actors are in fact ex-IU affiliates or formerly close to IU (or Izquierda Anti-Capitalista). 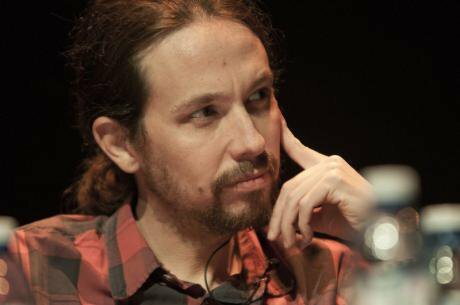 Podemos is therefore a populist party that fails to actually say anything new or different from existing formations. * Podemos reproduces a Spanish trait of party politics known as “personalismo”, which is all about a politics of charismatic leadership, generally with a retinue of acolytes, and which exalts the leader above the base of support. * When social movements invest their energy in political parties, the movements inevitably decline and activist leadership is coopted into party politics. This argument was reflected well in a tweet of a 15-M activist following the elections: “I wonder how long it will take for some people to stop doing things for themselves and start expecting Pablo Iglesias to do it for them." * The 15-M movement was great but it is over, and it is necessary to channel some of that energy into party politics and institutions to make lasting change, rather than see it dissipate. * The 15-M movement is not over, but has evolved into a myriad of projects and outcomes, one of which is the creation of grassroots parties such as Podemos or Partido X. Podemos embodies the spirit of 15-M and is therefore “15mayista”. * Podemos is the most horizontal party in practice out there. * There is no reason to think there is only one line of resistance, there is no contradiction between strong social movements and a progressive political party ("one foot in the institutions and 100 in the streets" as the saying goes). See Flesher Fominaya (2007) “Autonomous Movement and the Institutional Left: Two Approaches in Tension in Madrid's Anti-globalization Network”, South European Society & Politics, Vol 12, 3, 2007, pp.335-358.. The campaign letter is available here.